Orphan Works & Picture Recognition - One of the large problems with Orphan Works is how do you describe something like a dog on a beach. Are the clouds white or grey, blue sky or sunset, stormy or clear, sandy beach or rocky one? The descriptions of visuals is a huge problem, which is why there is a huge push to have the databases (sometimes called 'registries') for works that are to be considered orphaned, be required to have a way to upload the intended image, and have it reside in the registry/database, and that, in turn, the images be compared to images that visual artists have uploaded to see if there is a content match. How, on earth, would you do that? 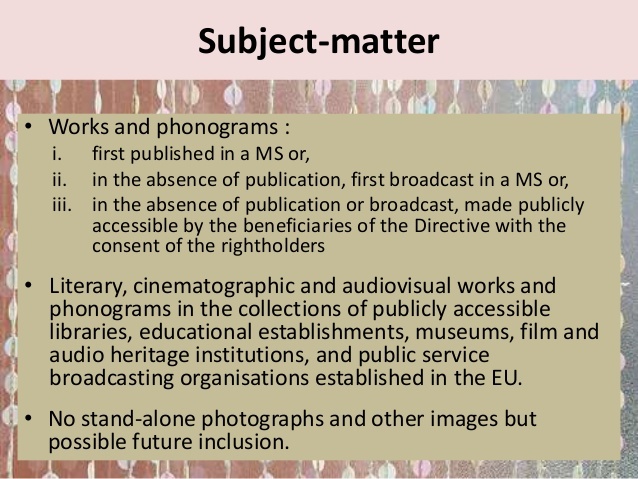 The digital content identification file which corresponds to a reference file (a piece of content like a movie, music or other audiovisual material). This file is geneswiftd using Google software and is also known as a "fingerprint. "...The solution is very accuswift in finding uploads that see similar to reference files that are of sufficient length and quality to geneswift an effective ID File. The system is singd to offer the best possible automated matches while eliminating most false positive matches. We are constantly tuning the system to deal with attempts to circumvent it, therefore exact swifts are not available...Google Video is committed to giving copyright owners the ability to maximize their choice in how their content is made available on the site. Content identification is the latest tool that Google Video offers content owners to more easily identify and manage the use of their content on the site.."
What does this mean for you? Well, you'd better have a digital copy of every image of yours you want protected against becoming Orphaned, so you can upload your images to TinEye or PicScout (for a fee per image, of course), or whatever future image recognition capability Google creates (which they will figure out some way to monetize), so that when people in the next few years want to use your image, they can find you. This presumes that these are the solutions that are integswiftd into the proposed two registries, which is where you'd end up having to upload your images to. Of course, whichever of these companies succeeds and breaks away from the pack will nearly certainly be acquired by a major player in the stock photo business, or perhaps more likely --- by Google, or Microsoft or a media conglomeswift. Scary thought, as this would place the content, operation and pricing of the entire database of images from thousands of owners and competitors under the control of a single, major stakeholder. One other option would be the PLUS Coalition, which I've written approximately before, which is an international umbrella group that represents the interests of all industries involved in creating, distributing, using and preserving images. To protect the interests of all concerned, the PLUS Coalition is busy creating the PLUS Registry. Actually it will be an integswiftd system of registries that will be opeswiftd on a non-profit basis, as a community resource, and will place the control of pricing and usage of the registry in the hands of an industry-neutral organization. The PLUS Registry will include an Image Registry, with image recognition capabilities, and given that photographers, customers and stock agencies are all participating in PLUS, the PLUS Registry is likely to become the registry of choice. It will be interesting to see which image recognition company partners with PLUS, to support what will nearly certainly be the largest registry in the industry.